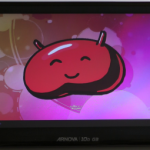 Announced a few months ago (from semi-official sources) the Android 4.1/4.2 Jelly Bean availability on the ARCHOS G9 tablets is no more, as the vendor has mentioned yesterday on their Facebook that there won’t be any Jelly Bean update for the ARCHOS Gen9 devices. Archos Worldwide Marco Antunes – Unfortunately after many months of analysis and testing it has been decided that, due to the multiple hardware configurations available on our G9 range and the complexities these add, we will not release an Android 4.1 “Jelly Bean” update to the G9 range tablets. 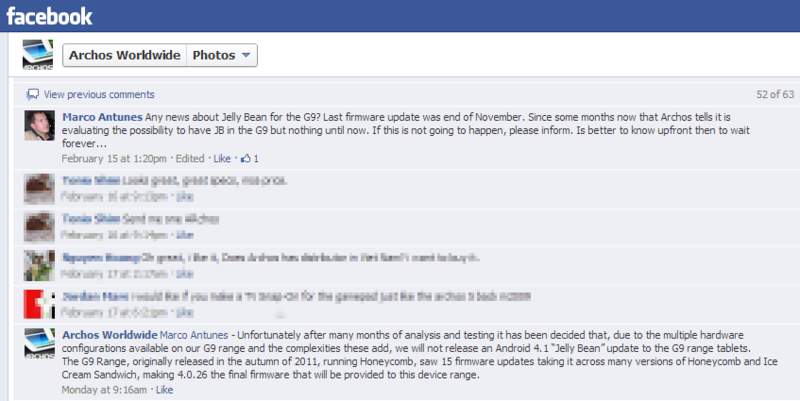 The G9 Range, originally released in the autumn of 2011, running Honeycomb, saw 15 firmware updates taking it across many versions of Honeycomb and Ice Cream Sandwich, making 4.0.26 the final firmware that will be provided to this device range. 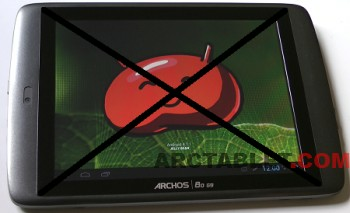 Our understanding of the situation is that ARCHOS G9, previous generation tablets have seen a great deal of variations in the hardware platform: from TI OMAP 4430 or OMAP 4460 processors running at 1 GHz, 1.2 GHz and 1.5 GHz, flash or hard disks storage and different types of touch panel. These seem to have created multiple problems in maintaining updates, as some serious issues with devices not booting after a firmware update were reported in the past. 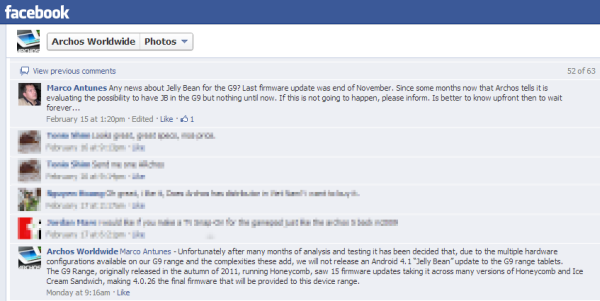 The effort of porting Jelly Bean to the G9 has probably been judged too high in regards to the requirements of supporting an old model. 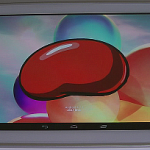 For those looking for latest Android 4.2 Jelly Bean support on the G9 devices, you also have the option of using unofficial firmwares, but these are less mature and not supported by ARCHOS.